The first robotic spacecraft was launched by the Soviet Union (USSR) on 22 July 1951, a suborbital flight carrying two dogs Dezik and Tsygan. Four other such flights were made through the fall of 1951. 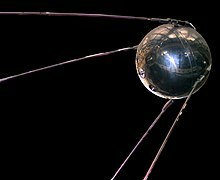 The first artificial satellite, Sputnik 1, was put into a 215-by-939-kilometer (116 by 507 nmi) Earth orbit by the USSR) on 4 October 1957. On 3 November 1957, the USSR orbited Sputnik 2. Weighing 113 kilograms (249 lb), Sputnik 2 carried the first living animal into orbit, the dog Laika. Since the satellite was not designed to detach from its launch vehicle's upper stage, the total mass in orbit was 508.3 kilograms (1,121 lb). In a close race with the Soviets, the United States launched its first artificial satellite, Explorer 1, into a 193-by-1,373-nautical-mile (357 by 2,543 km) orbit on 31 January 1958. Explorer I was a 80.75-inch (205.1 cm) long by 6.00-inch (15.2 cm) diameter cylinder weighing 30.8 pounds (14.0 kg), compared to Sputnik 1, a 58-centimeter (23 in) sphere which weighed 83.6 kilograms (184 lb). Explorer 1 carried sensors which confirmed the existence of the Van Allen belts, a major scientific discovery at the time, while Sputnik 1 carried no scientific sensors. 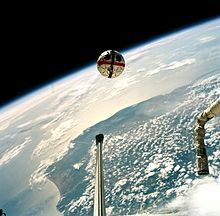 On 17 March 1958, the US orbited its second satellite, Vanguard 1, which was about the size of a grapefruit, and remains in a 360-by-2,080-nautical-mile (670 by 3,850 km) orbit as of 2016[update]. Nine other countries have successfully launched satellites using their own launch vehicles: France (1965), Japan and China (1970), the United Kingdom (1971), India (1980), Israel (1988), Iran (2009), North Korea (2012), and New Zealand (2018). In planetary exploration missions involving robotic spacecraft, there are three key parts in the processes of landing on the surface of the planet to ensure a safe and successful landing. This process includes a entry into the planetary gravity field and atmosphere, a descent through that atmosphere towards a intended/targeted region of scientific value, and a safe landing that guarantees the integrity of the instrumentation on the craft is preserved. While the robotic spacecraft is going through those parts, it must also be capable of estimating its position compared to the surface in order to ensure reliable control of itself and its ability to maneuver well. The robotic spacecraft must also efficiently perform hazard assessment and trajectory adjustments in real time to avoid hazards. To achieve this, the robotic spacecraft requires accurate knowledge of where the spacecraft is located relative to the surface (localization), what may pose as hazards from the terrain (hazard assessment), and where the spacecraft should presently be headed (hazard avoidance). Without the capability for operations for localization, hazard assessment, and avoidance, the robotic spacecraft becomes unsafe and can easily enter dangerous situations such as surface collisions, undesirable fuel consumption levels, and/or unsafe maneuvers. Integrated sensing incorporates an image transformation algorithm to interpret the immediate imagery land data, perform a real-time detection and avoidance of terrain hazards that may impede safe landing, and increase the accuracy of landing at a desired site of interest using landmark localization techniques. Integrated sensing completes these tasks by relying on pre-recorded information and cameras to understand its location and determine its position and whether it is correct or needs to make any corrections (localization). The cameras are also used to detect any possible hazards whether it is increased fuel consumption or it is a physical hazard such as a poor landing spot in a crater or cliff side that would make landing very not ideal (hazard assessment). Spacecraft propulsion is a method that allows a spacecraft to travel through space by generating thrust to push it forward. However, there isn’t one universally used propulsion system: monopropellant, bipropellant, ion propulsion, and etc. Each propulsion system generates thrust in slightly different ways with each system having its own advantages and disadvantages. But, most spacecraft propulsion today is based on rocket engines. The general idea behind rocket engines is that when an oxidizer meets the fuel source, there is explosive release of energy and heat at high speeds, which propels the spacecraft forward. This happens due to one basic principle known as Newton’s Third Law. According to Newton, “to every action there is an equal and opposite reaction.” As the energy and heat is being released from the back of the spacecraft, gas particles are being pushed around to allow the spacecraft to propel forward. The main reason behind the usage of rocket engine today is because rockets are the most powerful form of propulsion there is. For a propulsion system to work, there is usually always an oxidizer line and a fuel line. This way, the spacecraft propulsion is controlled. But in a monopropellant propulsion, there is no need for an oxidizer line and only requires the fuel line. This works due to the oxidizer being chemically bonded into the fuel molecule itself. But for the propulsion system to be controlled, the combustion of the fuel can only occur due to a presence of a catalyst. This is quite advantageous due to making the rocket engine lighter and cheaper, easy to control, and more reliable. But, the downfall is that the chemical is very dangerous to manufacture, store, and transport. A bipropellant propulsion system is a rocket engine that uses a liquid propellent. This means both the oxidizer and fuel line are in liquid states. This system is unique because it requires no ignition system, the two liquids would spontaneously combust as soon as they come into contact with each other and produces the propulsion to push the ship forward. The main benefit for having this technology is because that these kinds of liquids have relatively high density, which allows the volume of the propellent tank to be small, therefore increasing space efficacy. The downside is the same as that of monopropellant propulsion system: very dangerous to manufacture, store, and transport. An ion propulsion system is a type of engine that generates thrust by the means of electron bombardment or the acceleration of ions. By shooting high-energy electrons to a propellant atom (neutrally charge), it removes electrons from the propellant atom and this results the propellant atom becoming a positively charged atom. The positively charged ions are guided to pass through positively charged grids that contains thousands of precise aligned holes are running at high voltages. Then, the aligned positively charged ions accelerates through a negative charged accelerator grid that further increases the speed of the ions up to 90,000 mph. The momentum of these positively charged ions provides the thrust to propel the spacecraft forward. The advantage of having this kind of propulsion is that it is incredibly efficient in maintaining constant velocity, which is needed for deep-space travel. However, the amount of thrust produced is extremely low and that it needs a lot of electrical power to operate. Robotic spacecraft are specifically designed system for a specific hostile environment. Due to their specification for a particular environment, it varies greatly in complexity and capabilities. While an uncrewed spacecraft is a spacecraft without personnel or crew and is operated by automatic (proceeds with an action without human intervention) or remote control (with human intervention). The term 'uncrewed spacecraft' does not imply that the spacecraft is robotic. An example of a fully robotic spacecraft in the modern world would be SpaceX’s Dragon. The SpaceX Dragon is a robotic spacecraft designed to send not only cargo to Earth’s orbit, but also humans as well. The SpaceX Dragon’s total height is 7.2 m (23.6 ft) with a diameter of 3.7 m (12 ft). The total launch payload mass is 6,000 kg (13,228 lbs) and a total return mass of 3,000 kg (6,614 lbs), along with a total launch payload volume of 25m^3 (883 ft^3) and a total return payload volume of 11m^3 (388 ft^3). The total duration of the Dragon in Earth’s orbit is two years. In 2012 the SpaceX Dragon made history by becoming the first commercial robotic spacecraft to deliver cargo to the International Space Station and to safely return cargo to Earth in the same trip. This feat that the Dragon made was only achieved previously by governments. Currently the Dragon is meant to transfer cargo because of its capability of returning significant amounts of cargo to Earth despite it originally being designed to carry humans. ^ David Whitehouse (2002-10-28). "First dog in space died within hours". BBC NEWS World Edition. Archived from the original on 2002-10-28. Retrieved 2013-05-10. The animal, launched on a one-way trip on board Sputnik 2 in November 1957, was said to have died painlessly in orbit about a week after blast-off. Now, it has been revealed she died from overheating and panic just a few hours after the mission started. ^ "Sputnik 2, Russian Space Web". 3 November 2012. ^ Bob Christy (2013-05-10). "Firsts in Space: Firsts in Space". Zarya. Archived from the original on 2013-05-10. Retrieved 2013-05-10. ^ "Air University Space Primer, Chapter 10 – Spacecraft Design, Structure And Operation" (PDF). USAF. ^ "Chapter 11. Typical Onboard Systems". JPL. ^ Howard, Ayanna (January 2011). "Rethinking public–private space travel". Space Policy. 29: 266 – via Science Direct. ^ LU. K. KHODAREV (1979). "Space Communications". The Great Soviet Encyclopedia. Archived from the original on 1979. Retrieved 2013-05-10. The transmission of information between the earth and spacecraft, between two or more points on the earth via spacecraft or using artificial means located in space (a belt of needles, a cloud of ionized particles, and so on), and between two or more spacecraft. ^ "Micrometeoroid and Orbital Debris (MMOD) Protection" (PDF). NASA. Archived from the original (PDF) on 2009-10-29. Retrieved 2013-05-10. ^ Hall, Nancy (May 5, 2015). "Welcome to the Beginner's Guide to Propulsion". NASA. ^ Zhang, Bin (October 2014). "A verification framework with application to a propulsion system". Expert Systems with Applications. 41: 5669 – via Science Direct. ^ Chen, Yang (April 2017). "Dynamic modeling and simulation of an integral bipropellant propulsion double-valve combined test system". Acta Astronautica. 133: 346–374 – via Science Direct. ^ Patterson, Michael (August 2017). "Ion Propulsion". NASA. ^ Davis, Phillips. "Basics of Space Flight". NASA. ^ K. Schilling; W. Flury (1989-04-11). "AUTONOMY AND ON-BOARD MISSION MANAGEMENT ASPECTS FOR THE CASSINI-TITAN PROBE" (PDF). ATHENA MARS EXPLORATION ROVERS. Archived from the original (PDF) on 1989-04-11. Retrieved 2013-05-10. Current space missions exhibit a rapid growth in the requirements for on-board autonomy. This is the result of increases in mission complexity, intensity of mission activity and mission duration. In addition, for interplanetary spacecraft, the operations are characterized by complicated ground control access, due to the large distances and the relevant solar system environment[…] To handle these problemsn, the spacecraft design has to include some form of autonomous control capability. ^ "Frequently Asked Questions (Athena for kids): Q) Is the rover controlled by itself or controlled by scientists on Earth?" (PDF). ATHENA MARS EXPLORATION ROVERS. 2005. Archived from the original (PDF) on 2009-10-29. Retrieved 2013-05-10. Communication with Earth is only twice per sol (martian day) so the rover is on its own (autonomous) for much of its journey across the martian landscape. Scientists send commands to the rover in a morning "uplink" and gather data in an afternoon "downlink." During an uplink, the rover is told where to go, but not exactly how to get there. Instead, the command contains the coordinates of waypoints toward a desired destination. The rover must navigate from waypoint to waypoint without human help. The rover has to use its "brain" and its "eyes" for these instances. The "brain" of each rover is the onboard computer software that tells the rover how to navigate based on what the Hazcams (hazard avoidance cameras) see. It is programmed with a given set of responses to a given set of circumstances. This is called "autonomy and hazard avoidance." ^ Anderson, Chad (November 2013). 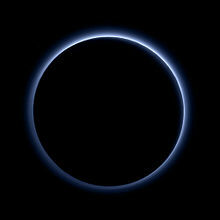 "Rethinking public–private space travel". Space Policy. 29: 266–271 – via Science Direct. ^ "Intelsat Picks MacDonald, Dettwiler and Associates Ltd. for Satellite Servicing". press release. CNW Group. Archived from the original on 2011-05-12. Retrieved 2011-03-15. MDA plans to launch its Space Infrastructure Servicing ("SIS") vehicle into near geosynchronous orbit, where it will service commercial and government satellites in need of additional fuel, re-positioning or other maintenance. ... MDA and Intelsat will work together to finalize specifications and other requirements over the next six months before both parties authorize the build phase of the program. The first refueling mission is to be available 3.5 years following the commencement of the build phase. ^ Morring, Frank, Jr. (2011-03-22). "An End To Space Trash?". Aviation Week. Retrieved 2011-03-21. ViviSat, a new 50-50 joint venture of U.S. Space and ATK, is marketing a satellite-refueling spacecraft that connects to a target spacecraft using the same probe-in-the-kick-motor approach as MDA, but does not transfer its fuel. Instead, the vehicle becomes a new fuel tank, using its own thrusters to supply attitude control for the target. ... [the ViviSat] concept is not as far along as MDA.